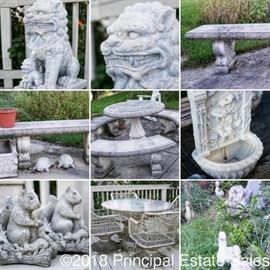 Fairborn Estate Sale - Seeing is Hardly Believing! 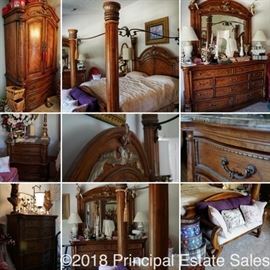 AddressThe address for this sale in Fairborn, OH 45324 will no longer be shown since it has already ended. ***PARKING: Roadside parking only. Driveway reserved for large item pick up. Please park safely and legally at all times. Principal Estate Sales is not responsible for any accidents, damage, fines, tickets, theft, injury or any other mishap that can occur as a result of parking on a public street. Neither is the homeowner. Please be respectful of neighbors. ***PAYMENT for items may be made via cash or credit card. An additional 3% convenience fee will be added to credit card purchases, and proper ID is required in addition to signing a statement regarding chargebacks. *All credit card purchases are final, and all items are sold as is. ***BRING HELP TO LOAD ITEMS. We do not offer moving services for large items. We do, however, have a reasonably priced company we can refer you to - ask us for their card! All items must be removed by 4pm Sunday, unless other arrangements are made PRIOR to purchase. The House! 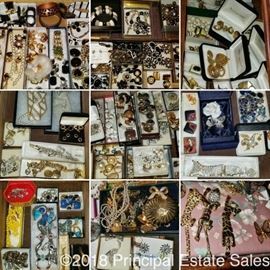 It will be either for rent or for sale once we wrap up the estate sale. It has the biggest back deck I have ever seen, overlooking a huge pond that is home to a Kingfisher that you can go out and watch at your leisure. Vaulted ceilings and the whole 9 yards (clearly, I am not a realtor and not well versed in the house selling jargon, but it is SUPER nice and EXTREMELY clean!). Ask me for the owner's number, and I'll put you in touch! Very close to WPAFB, the shopping mall at Fairfield Commons, many restaurants, and in a nice, quiet neighborhood where lots of nice people are all the time exercising and walking their awesome dogs. There's 4 bedrooms on the 2nd floor, 2 1/2 bathrooms, a basement with 9 ft ceilings that could be easily finished, a eat in kitchen, living room, dining room, and formal living room. 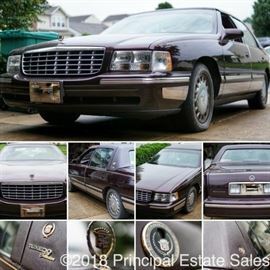 EXCELLENT CONDITION 1997 CADILLAC DEVILLE 4 DOOR SEDAN - 4.6L V8, F DOHC 32V, UNDER 60,000 MILES, FRONT WHEEL DRIVE, TUXEDO EDITION (ask to see the Carfax)! Did I say it has 58,000 miles?? It's like getting a brand new car! 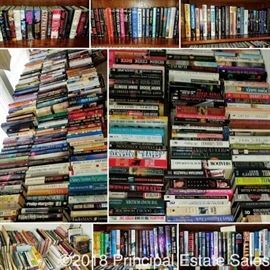 This sale has a better selection of books than your local library. Many 1st edition hard covers!! Also, those bookshelves are STELLAR! A fraction of the books! Artwork out of tiny wood shims...pretty neat, and I'm quite sure it would take an eternity to arrange. Listen...there's enough Christmas decor here to decorate all of Dayton. If you're in need, THIS IS THE SALE! The dragons and giraffes are my favorites. Just in case you were wondering. 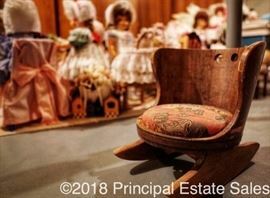 The dolls here are outstanding....but even more outstanding is their furniture!! Look at that set! Let's talk hat boxes. There is a LOT of them, in every design you could possibly imagine. Antique embroidered linens, scarves, gloves, & clutches galore! 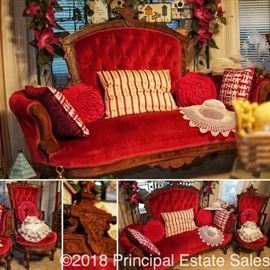 I really like this set - it's a pale green Victorian style sofa with wood trim and matching chair, in excellent condition and in very good taste. Those roosters are big...over 24" I'd say. Gold King & Queen busts in the Master bedroom. 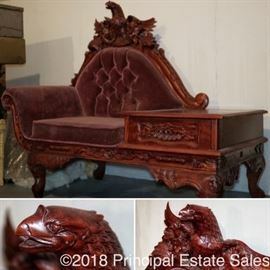 Goes well with such a regal master bedroom suite. There's tons of these nesting trunks / boxes. I'll be using the phrase "tons of" a LOT in these descriptions. 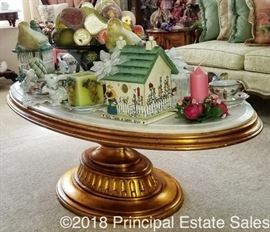 Glass top side table with Cherub / Angel base. Very unique. This antique stroller is in impeccable condition... The springs are still brand new, as they have never been engaged! A shot of the library. 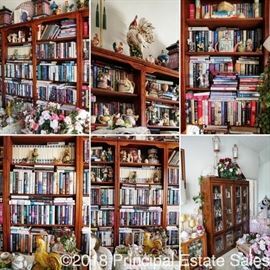 Before you doubt my quantification of the books, you should know that they are all doubled up on that bookcase, so there's 2 deep in every one! We've remedied that, and sorted them in the spare bedroom! Exquisite floral oil painting. There's also a matching one on the opposite wall. 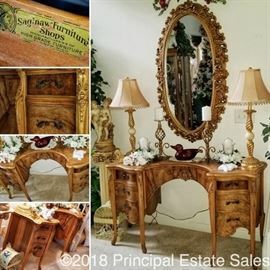 Queen Anne wingback next to a very unusual and neat accent table. Dual Victorian style arm chairs on either side of the harp shaped marble top table. There's like 4 rows of totes that look just like this, ALL CHRISTMAS decorations. Don't pay full retail price for your decorations, people! Look at this one doll, looking after this other doll. Such a precious arrangement. And that bassinet! There's a matching hot pink chair on the other side of the bedroom. Would look perfect in a cute little boutique!